Dream. Dress. Play. : Excited for Summer Giveaway is Here, Enter Today ! Excited for Summer Giveaway is Here, Enter Today ! Our newest Giveaway is here, we are excited for summer and we hope you are too. 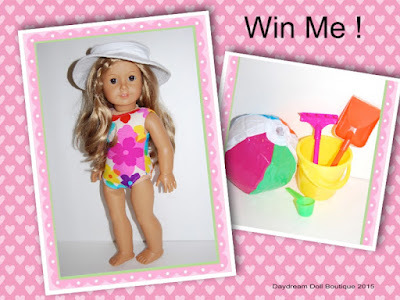 We are giving away a cute swimsuit with beach hat, beach ball and sand toy set. It's the perfect way to get your doll ready for summer, so enter today ! Go to the Daydream Doll Boutique web site and take a look around. Come back here and leave a comment telling us your favorite NEW ITEM and what you would pair it with from the website. Leave your comment(s) no later than midnight June 30 , 2015.
i love the summer days maxi dress and i would pair it with the heart gem metallic sandals in pink. I love Paris outfit paired up with heart metalic sandals. Hi. I'm already a follower. Favorite NEW item is the Everyday Capri, which I would pair with a tank top and sandals. Thanks. I would love to enter! I follow your blog by email. I love the Flower Brights outfit, and I would pair it with the Pink Sequin Purse. I also really like the American Cutie outfit, and I would pair it with the Red Fashion Sandals. Thanks so much for the giveaway! What an adorable giveaway! I have parental permission to enter. I follow your blog. My favorite new item is the water shoes. I would pair the water shoes with the new swimsuit outfit you are giving away! Thanks for the giveaway! I am going to be practical and say my favorite is the frame hangers as I really need to organize my doll clothes. I really love the beach set!!!! I would get the American Cutie outfit and pair it with the Silver Sneaker boots. The Nordic Snuggle Pjs + Fuzzy Boots outfit is super cute. My Delilah would love to have this. Hi i'm Kara and i would like to enter this giveaway. My favorite outfit is the I Love Paris. Thanks so much for this giveaway. My favorite new item are those lacework sandals, and the coleman stove set. I like the Paris outfit and would pair it up with the white sandlas. So super cute. Now following by email and GFC. I like the Coleman Doll Green Camp Stove Set and I would pair it with the Coleman® Doll Cooler Blue + Lemonade. I asked my daughter what her favorite is and she chose the kitty ballerina outfit and she wants to pair it with the new princess beanbag. I love the maxi summer dress and I would pair it with the new camping set! So fun! Cant wait for bitty baby clothes in July!! !